From online, can I stop sharing a file or folder? To make a file or folder private again, you can stop sharing it. Select the people icon for the file or folder to open the Share dialog box. 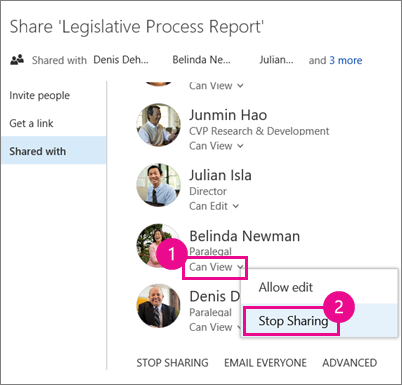 On the Shared with tab in the Share dialog box, select Can View or Can Edit next to the person you want to stop sharing with, and then select Stop Sharing. 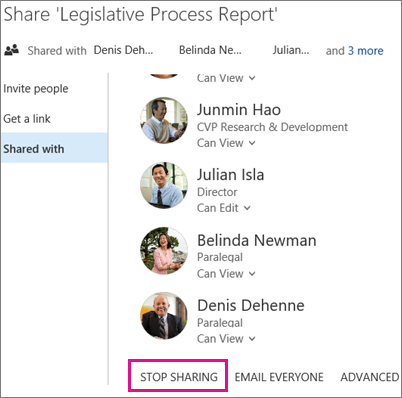 To stop sharing a file with everyone at once, select STOP SHARING below the list of people you're sharing with. Note: The STOP SHARING link that removes all users at once is not available for folders. To quickly stop sharing a folder with many users or groups, try this: Click ADVANCED, use the check boxes to select the users or groups you want to remove, and then click Remove User Permissions.